Wilmuth is a Nord running Chillfurrow Farm east of Whiterun. 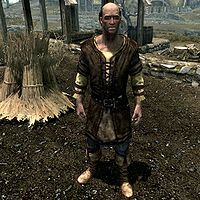 While the owner of the farmhouse, Nazeem, seems more interested in Whiterun and his limited influence on the local jarl, Wilmuth singlehandedly maintains the farm, working for twelve solid hours starting at 8am while sleeping for only four hours between midnight and 4am. At all other times he wanders restlessly around inside. He wears a simple set of farm clothes with a pair of boots, and wields an iron dagger. He only carries the key to the farmhouse and a small selection of common items and gold. Wilmuth is a member of the elemental mage class, which determines the level of his skills. This page was last modified on 13 December 2013, at 08:02.